Hey there! 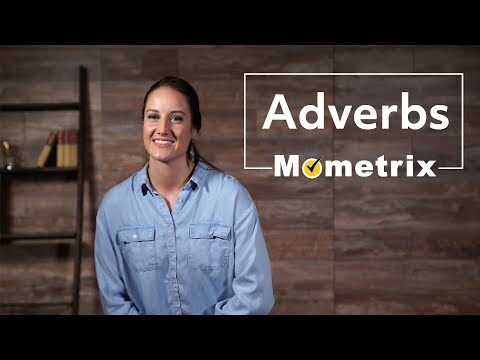 Welcome to this Mometrix video on adverbs. Adverbs can oftentimes be confusing. But fear not Mometrix is at your service! An adverb is a word that modifies a verb, adjective, another adverb, determiner, noun phrase, clause, or sentence. It answers questions like how?, in what way?, when?, where, and to what extent? I think one of the reasons this can get a little confusing is because of it’s slight similarity to the function of an adjective. Let’s take a look. An adjective is a word that modifies a nouns, and pronouns. It primarily describes a certain quality of the word it is modifying. For instance, “the sky is beautiful,” or “ She is strong.” Beautiful, and strong are both qualities. Beautiful is being used to describe the sky, and strong is being used to describe she. Adjective are generally reserved for modifying your nouns, and pronouns; while adverbs pretty much modify anything else. Now, let’s get back to adverbs. Let’s modify the adjectives in our previous sentences. “The sky is extremely beautiful.” Here we have used the adverb “extremely” to describe to what extent the sky is beautiful. We have modified the adjective. For the next sentence, let’s modify it in a different way. “She is physically strong.” Now what we have done is used “physically” to describe the way in which she is strong. Try this one yourself. Which sentence contains the adverb. A) “She ran fast,” or B) “she is fast.” The answer is A! So here we have the same word, but it’s modifying different things. In sentence A “fast” is modifying the verb “ran,” but in sentence B “fast” is modifying the noun “she.” Therefore, because of our definitions, we know that one is functioning as an adverb, and the other as an adjective. Since sentence A is modifying a verb, and not a noun, we know that it is an adverb. I hope this video was effective in helping you better understand and adverb, and its function. For further help, be sure to check out our other videos by clicking the subscribe button below.